WP Fastest Cache is Doc’s recommended plugin for WordPress when using CloudFlare. Despite the increased speed CloudFlare gives your site, WordPress still has to generate each page dynamically. Above average visitor load can cause database connection timeouts. And even get your site shut down if on shared hosting. You can gain a ton more website speed by caching your posts, pages, tags, and categories. When caching your site a generated html page is delivered to your site visitor. This saves WordPress from doing all the work saving bandwidth and server resources. We have been running under CloudFlare for several years but still were not happy with the sites performance. We tried two WordPress caching plugins (WP Total Cache and WP Super Cache) but both caused bumbled url problems. But this one WP Fastest Cache is so simple and works fantastic. Here’s our best advice on setting it up. First before installing WP Fastest Cache – if you have used another cache plugin before and deleted it – chances are it left settings in both your .htaccess and wp-config file. It’s advised to use a file manager to edit or if not available your ftp client to download both files to be certain no previous cache entries exist. Also be sure both files are writable by owner. There is probably a left over directory under wp-content > cache. If so delete it. After doing those steps download WP Fastest Cache and activate it. Navigate to WP Fastest Cash settings menu on WordPress side bar and configure it’s settings. On my blogs i use CloudFlare to handle all minification and run Rocket Loader to further speed up any scripts. So when configuring WP Fastest cache do not check any of it’s minification settings. Here is a screen shot of my config. When clicking on the preload link a box pops up allowing you to select the number of pages to cache per minute. If on shared hosting leave it at it’s default. On this site we are generating 12 pages per minute. 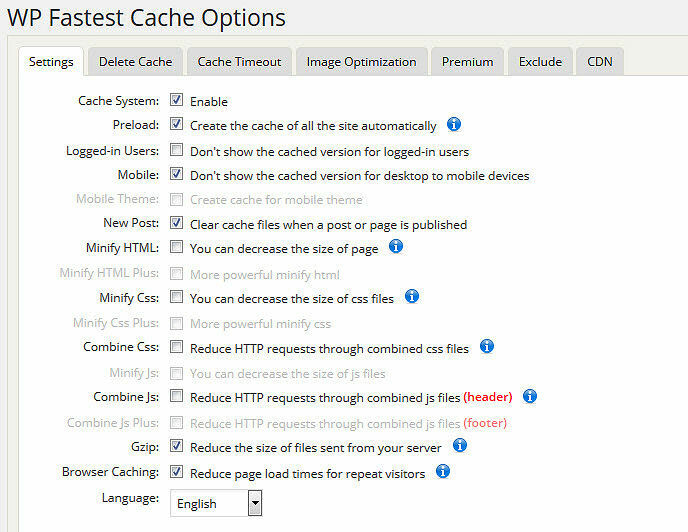 Best cache configuration options for CloudFlare users. Navigate to the exclusion tab. Defaulted url already was wp-admin, but since i am not using WP Fastest Cache’s minification options, wp-includes was added to excluded WordPress directories. Facebook and WhatsApp are default user agents to exclude. We recommend going to CloudFlare and purging the cache they have stored for your site. This lets them cache the generated html snapshots. Taking a good sized load off your server. Switching the minification over to cloudflare instead of doing it via Fastest Cache actualy made a difference. Nice! Thanks for the tip. WP Fastest Cache is the best WordPress plugin I’ve found. Thanks for your comment.